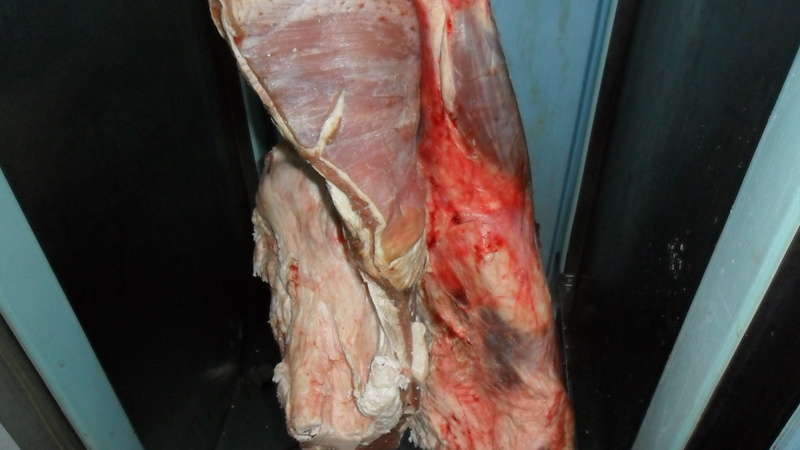 Aging Meat… and its OK to eat veal! There is no way I can argue with those vegan type people about the production of veal. It is undoubtedly one of the most disrespectful, irresponsible forms of animal treatment second to only foire production. I will definitely touch on that debauchery in a later post. When we go spend our hard earned money, we want ingredients and food preparations that are worth the coin, that’s inventive and just plain old fulfilling. This does not entail us eating with our eyes closed. I can recall a former chef whom I respect a great deal but will remain nameless “educate” me on the way a good cut of veal should be white with a tint of pink. He failed to mention that the paleness comes from a forced anemia. There are tons of bloggers and videos on the net exposing the truth about veal production so I won’t go there in this post. Unless you guys want me to of course. I LOVE VEAL! Until recently, for the afore mentioned reasons, it never had a place on my menu. I actually have a veal midsection hanging in my meat locker right now that I landed from fancy meats of Vermont. I let it hang at just around 36 degrees for about 21 days. This aging helps develop a deep flavor that is noticed instantly. 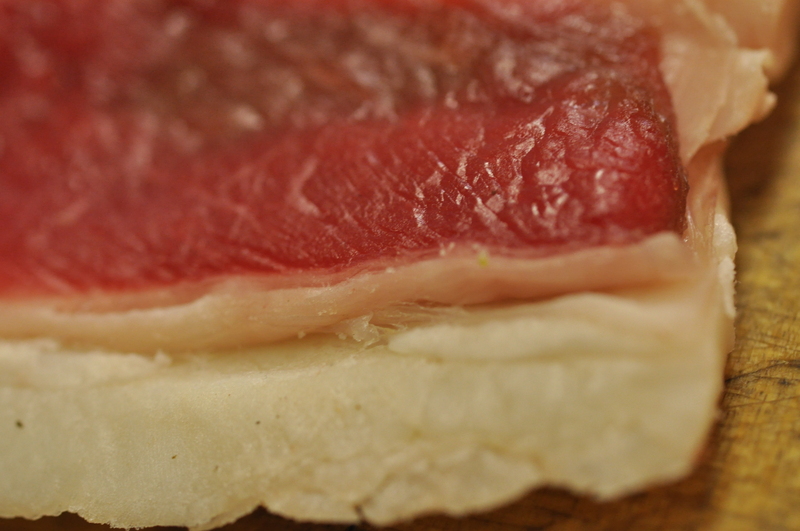 The outside layer will dry and crust over, thus protecting the inner flesh from rotting. I put a BUNCH of salt. Like one bag of rock salt at the bottom of the cooler to reduce the microbe production. If it gets furry, don’t worry. Just wipe it with a towel doused in salt water if it makes you feel better. I don’t. All of the outside will be trimmed revealing a perfectly aged primal cut of veal. I skipped the part where I tell you how its ok to eat veal now! On purpose of course. Lydia Ratcliff at seventy plus years runs a cooperative of, responsible veal producers through her company fancy meats of Vermont. You can find these veal calves on some of New England’s conscious chefs menus labeled humanely raised veal or rose veal. I was so stoked when I found this out. I hadn’t eaten veal in years. (now foire, that’s another story! Its so good) I found out that these responsible dedicated farmers raise their calves from birth on a diet of pasture flora and good ol fashioned mother’s milk. I have it on my menu as humanely raised veal. You may see it as rose veal as well. Yeah the cuts are a little bigger but I seriously like it better. Its less of a conduit and I think it stands out as a more distinct flavor. If you have ordered veal in restaurants before, you probably noticed notice its opaqueness. This lack of color (anemia) is due to the lack of nutrients. After the calves are born they are immediately taken away from their moms and give a milk substitute formula lacking necessary nutrients for long term survival. When a calf is fed real milk not formula and allowed to pasture it develops necessary nutrients to live a comfortable and healthy albeit short life. Because of these nutrients, the flesh develops a pinkish rosy color. It is super important to vote with your dollars and only buy humanely raised veal. IT TASTE BETTER ANYWAY! Don’t eat with your eyes closed and know where ALL your meat comes from. Or get started vegetable only diet. But seriously, who wants to do that. Thanks again for checking my site and read on for a instructions on how to PROPERLY age meat without getting food poisoning. Oh yeah Here is a cool little video about Lydia and her cooperative on thoughtcast! There are two kinds of aging when it comes to meat wet aging and dry aging. Wet aging is when the beef is put into a vacuum sealed plastic bag and allowed to age in its own juices. Wet aging takes less time than dry aging, generally around seven days. 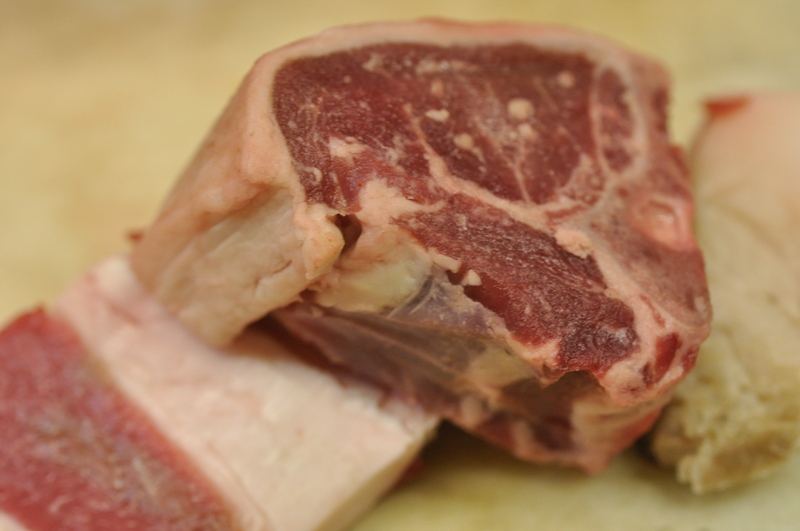 Wet aging is the type of aging that most butchers do now. Dry aging is different though, and is actually when you want the beef to dry out. It takes anywhere from seven to twenty-one days to dry age beef. This process allows the moisture in the muscle to evaporate, and this gives the meat a deeper beefy or vealy flavor. Also, the beef is naturally tenderized because of the fact that the enzymes in the beef are breaking down. One thing to keep in mind is that you cannot dry age single steaks because they are too thin. For the purposes of this article you will need a primal piece of veal or beef such as a whole ribeye or a whole loin strip. If you have access to larger sections this will be fine as well but obviously you are going to need a large enough cooler. You will need a rectangle pan, a wire rack, meat thermometer and some dish towels. As I mentioned previously I hang my larger cuts so air gets it from all directions and the outer dries faster. 1 Rinse your piece of beef with cold water. 2 Dry the beef well with one or two large white dish towels. Set it aside for a minute and allow it to drain. 3 Put your pan and wire rack on the bottom shelf of your refrigerator (because this is where it is coldest). Wrap your beef in another of your large white dish towels and put it on the rack. Using your thermometer measure the temperature, you don’t want a temperature any warmer than 36 degrees F.
Store dry aged beef in your refrigerator for up to twenty-one days. If you haven’t eaten all the meat in twenty-one days, cut the rest of it into steaks. Put it in freezer-proof, heavy duty plastic wrap, or plastic bags and put it in your freezer.